Family wealth is often created through many years of hard work and dedication and it is handed down with every passing generation. Passing away of the loved ones is a time that triggers emotions as well as legal consequences. Individuals who gain assets through inheritance should be aware of the potential tax consequences. I say “potential” because there is no federal tax on inheritance and only handful of states levy taxes on inheritance. What states levy taxes on inheritance? Indiana – Form IH-6; the state sets categories of beneficiaries and exemptions amounts; surviving spouses and charities are 100% exempt; for other beneficiaries tax rates vary from 1-10% for the second line of descendents all the way to 20% for the most distant relatives. Iowa – Form IA706; tax rates range from 5-15%. Kentucky – Form(s) 92A200, 92A201, or 92A205; tax rates range from 4-16%. Maryland – Certification of Inheritance Tax; tax rates range from 0-10%; three different tax schedules depend on the date a decedent passed away. Nebraska – Probate Form 500; tax vary from 1% for immediate relatives on inheritance amount of more than $10,000 all the way to 18%; the state allows for several exemptions, deductions, and credits. New Jersey – Form IT-R (residents) or Form IT-NR (nonresidents); based on beneficiary classification and inheritance amount, the closest relatives are entirely exempt, tax rates vary between 0-16% for other relatives. Pennsylvania – Form REV-1500 (resident descendent) or REV-1737-A (nonresident); tax rates range from 0-15%. Tennessee – Form INH301 or INH302 (long form vs short); tax rates range from 5.5-9.5% over the exemption limits. 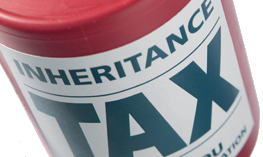 Are there exemptions from inheritance tax? States that collect inheritance tax often offer exception for individuals based on their relationship to the deceased. In all cases, spouses of the deceased individual are 100% exempt. Some states grant 100% exemptions to beneficiary children; nonprofit, religious, charitable, or public organizations may be exempt from filing inheritance form if the amount received is below limits established by a particular state. Further down the family line there are fewer exemptions that usually have a certain dollar limit. For example, stepchildren receiving inheritance don’t have to file an inheritance tax return if the amount is less than $100,000; those amounts vary by state. Keep in mind that in many states inheritance tax is not only levied on real estate. Inheritance may include cash, bank accounts, gifts, automobiles, jewelry, other valuable assets, and intangible assets such as stocks, bonds, mutual funds, etc. Check with your state, which assets/items should appear on the inheritance tax return.